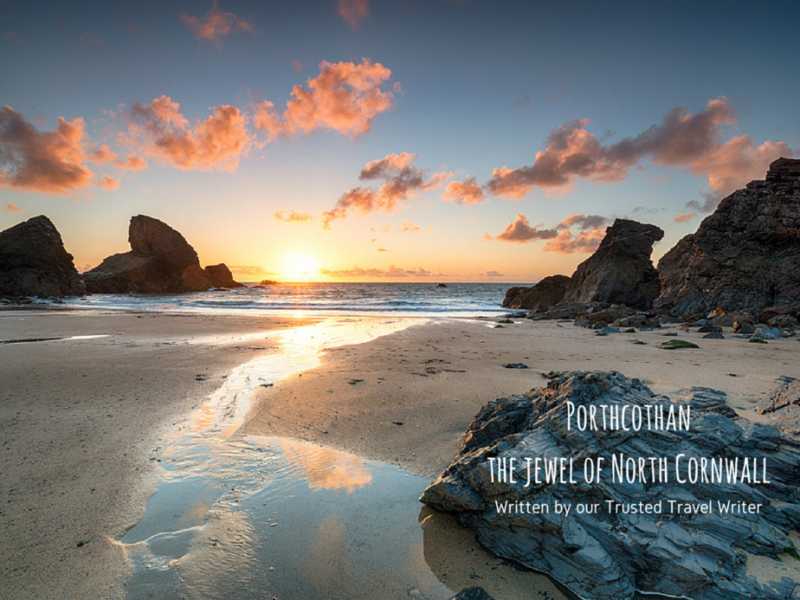 Porthcothan is a small village nestled in a lovely bay between Newquay and Padstow and 1½ miles from the restaurant, basic shops and Rick Stein’s popular pub in St Merryn. Like precious treasures of ancient Egypt, the north Cornish coast is a spectacular vision of opulent gold, turquoise and white. But here on the Atlantic coast the rich colours are part of the natural landscape: the golden sandy beaches, the deep blue sea, the bright white waves rolling from the Atlantic Ocean to the shore. This is reckoned to be the most beautiful coastline, not just in the South West, but on the planet. An audacious claim? No, this is truly a place of beauty, whether you come to walk, surf, sandcastle, rootle in rockpools or simply stand and stare. Porthcothan Bay beach is big and golden, a cove sheltered deep between cliffs and backed by ‘proper’ dunes. At low tide it’s modest, but when the tide turns the sea retreats apace, leaving a huge expanse of smooth-washed fine sand that never seems to get crowded. This section of coast is studded with fabulous beaches, like a string of pearls, so there’s plenty of room for everyone. Porthcothan is one of ‘seven bays for seven days’, all within a short distance of each other. Bring the family, the dog, Uncle Tom Cobley and all. This beach is perfect for all ages. It’s just a short hop across the road from the car park, so access is easy. From late May to the end of September, the reassuringly watchful lifeguards mean you can relax as your teenagers head out with surfboards. This isn’t the biggest or most consistent surf in Cornwall, but there are plenty of long rollers to give novices and beginners an adrenaline buzz. My 10 year old was chuffed to be finding his feet here – for a few precarious seconds – on his surfing debut. Little ones enjoy the fun of unintimidating waves, a great introduction to bodyboarding or bobbing about in a floaty boaty safely anchored to the shore by a length of rope. Sandbanks near the beach mean you can wade out quite far and find the sea getting shallower before you’re out of your depths. When the novelty of the sea wanes, there’s always sandcastles to be constructed or dams to be built across the stream that flows down the beach. And it’s a wonderful beach for dog owners too. Porthcothan is relaxed and pet friendly all year round and mutts of all shapes and sizes frolic in the waves and tear around the sand enjoying canine holiday high days without disapproving sidelong frowns. Low tide reveals rock pools and caves to explore. If you forget your fishing nets or any other seaside paraphernalia, just head for the little shop behind the dunes that has a good selection as well as deliciously creamy Cornish ice cream piled in generous cornets. Blackcurrant and toffee fudge are our favourites, or a mug of steaming hot chocolate on a chilly day. From Porthcothan Bay the famous South West Coast Path leads along National Trust cliffs, with their wonderful views, over Park Head in one direction to the dramatic beach rock stacks of Bedruthan Steps, or past Minnows Islands to Treyarnon Bay in the other. The best time to walk here is early summer when the wild flowers are amazing, swathes of vivid pink, yellow, purple and white carpeting the clifftop. Skylarks sing their hearts out and waves crash and echo round rugged inlets below. So is this little known jewel now top of your Cornwall bucket list?